Pool Preparation For Plastering | Coronado's Pool Renovations, Inc.
Coronado’s Pool Renovations specializes in Pool Preparation for Plastering swimming pools. Coronado’s Pool Renovations has been providing clean and quality prep work for the past 25 years! Clients are always happy with the quick and clean process of pool preparation. Coronado’s takes all necessary action to turn off power to pool equipment, water features, lights and auto water fills. If the existing tile is to remain, Coronado’s undercuts below the water line of the tile, and around all fittings, wall steps and light fixtures to ensure a flush finish for the new pool surface. Acid Wash: This method used Acid to clean and etch the substrate of the pool. Then picking/ Chipping Surface of the pool. Stripping is also used to strip old plaster down to the gunite. Find out more about our Acid Wash procedure. NO SANDBLASTING! NO MESS! 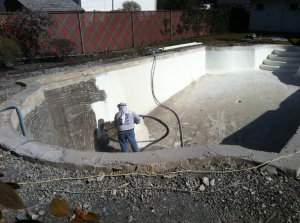 Coronado’s Pool Renovations used Waterblasting which a method that removes dirt minerals and loose plaster! Find out more about our Waterblasting procedure. NOTE: Anytime we use Acid wash we make sure the wash is thoroughly neutralized and disposed of according to EPA standards. Are a you Pool Contractor looking for a company to prep your project? Look no further than Coronado’s Pool Renovations! Check out our Pool Contractors page!